by partnering with Southern California mosques and proposing a set of theological principles that includes acknowledging that Christians and Muslims worship the same God. Apprising Ministries began our coverage of this in Rick Warren, Islam, And Jim Hinch when Warren accused Hinch of putting out an article with “multiple errors.” I also shared Hinch’s defense that came from my discussion with him. Then I would write Apprising Ministries Exclusive On Rick Warren, Jim Hinch, And Islam after I contacted Hinch again concerning how I might obtain a copy of the King’s Way because it hasn’t been published anywhere. He was kind enough to share the relevant portion concerning what it says about God. Then Ed Stetzer of the SBC’s Lifeway Research publishing arm decided to take a swipe at ministries like this and come to Warren’s defense. So, yesterday I wrote Rick Warren, Ed Stetzer, And Watchbloggers where I helped to focus attention on the issues and walk you through what’s at stake. Briefly, one can see why Hinch said what he did. Having the Bible and the Qur’an cited side by side surely gives the impression that we’re talking here about the same God Who “is one” and “the Creator.” This King’s Way document pretty clearly implies that the Muslim and the Christian believe in the same God. 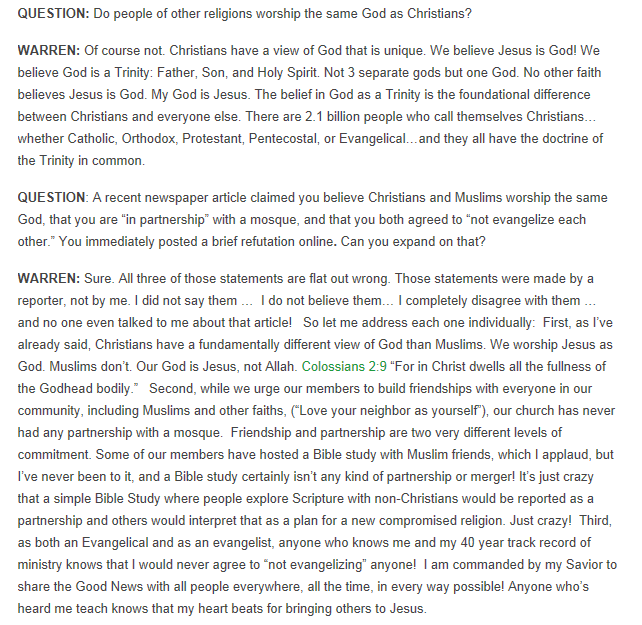 However I wonder, does Rick Warren and Saddleback make sure that the Muslims they meet with know they believe in a different God? And if so, then why use the ambiguous, and misleading, language? As another illustration of the confusion, I leave you with the below, which was up for around a month. Although only a select number of individuals were invited to this dinner, it demonstrates the new theological position of Saddleback. At the celebration, a document one year in the making was presented which encourages Christians and Muslims to appreciate the similarities of our faiths. The document encouraged that our communities work together towards the common good and to combat bigotry in a 1-2-3 plan. The first step in the plan identifies the belief in one God. This writer seems to under the impression that the King’s Way document 1) represents “the new theological position of Saddleback,” and 2) appears to imply this “one God” is the same God. 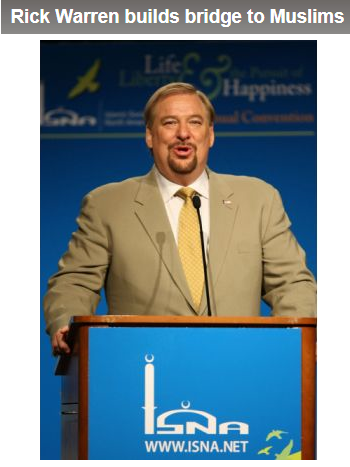 So, we’re left again to wonder where Saddleback and Rick Warren really stand. Is Saddleback interfaith pastor Abraham Meulenberg telling these Muslims that Saddleback Church’s new theological position is that they’re all believing in same God? Or, is the ambiguous language used so that unsuspecting Muslims will infer that this is Saddleback’s View? A new theological position? For a Christian church? Perhaps the members of the ISCS misunderstood the intent of this entire endeavor. If so, one wonders why Saddleback did not seek to clarify such a misunderstanding sometime between December and today. One also must surely wonder why the King’s Way excerpt that has emerged has been ignored by Warren and his team. 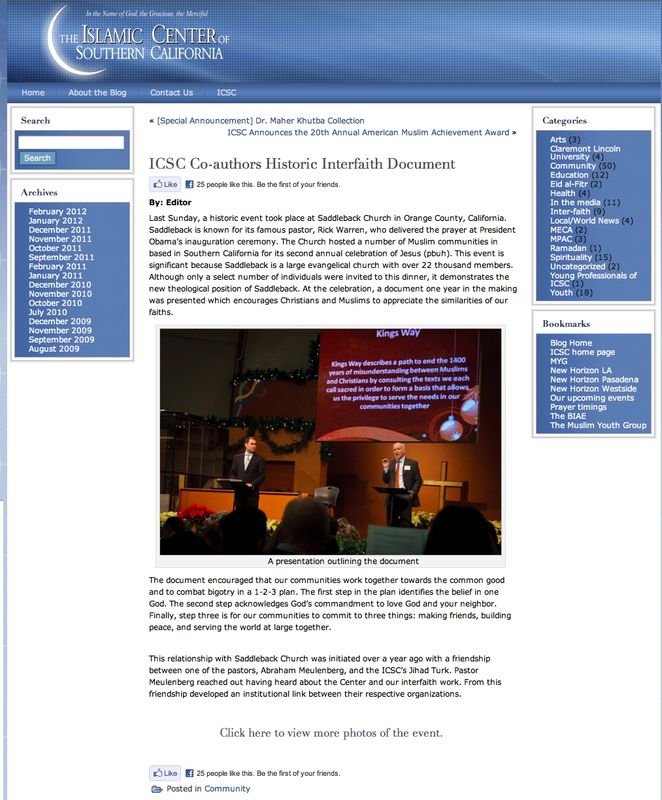 Finally, it cannot help but be questioned why it is that the ISCS has suddenly deleted this clear, boastful evidence of the December event and this “historic interfaith document.” In the interest of Christian ethic, we certainly hope that there is no “King’s Way Cover-up” underway.